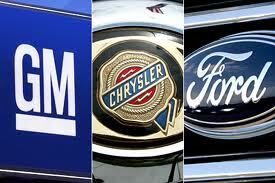 The "Big Three" auto makers: Exactly how loyal are their customers? Those of us “of a certain age” can remember the days of the Big Three U.S. auto makers. Each of them had a full brand lineup of vehicles designed to accompany a car owner’s pursuit of the American dream. For each step up the corporate or status ladder, there was a car perfectly suited for the event. General Motors had its five “ascending” brands: Chevrolet, Pontiac, Oldsmobile, Buick and Cadillac. Rival Chrysler Corporation had its five auto brands that tracked neatly with GMs: Plymouth, Dodge, DeSoto, Chrysler and Imperial. Ford Motor was a bit different in that it had only three flagship brands – Ford, Mercury and Lincoln – but the idea was the same. Capture the consumer at the very beginning … and stay with him or her for years thereafter. When I was growing up, I can recall friends who came from a GM family, a Ford family or a Chrysler family – such was affinity and loyalty people felt for “their” car companies. Fast-forward to today, and the picture is completely scrambled. Not only has the prestige – and market share – of the U.S. car companies plummeted in the face of strong competition from foreign-based car rivals, but the brand offerings of the Big Three [sic] have been telescoped severely. GM is now down to three flagship car brands (Chevy, Buick and Cadillac), while Ford and Chrysler are down to two each (Ford and Lincoln … Chrysler and Dodge). Well … not exactly as planned. General Motors dropped Pontiac, Saturn and Hummer in the latest round of brand downsizing in 2009, but had hoped to keep most of the buyers of those vehicles in the GM family. Reportedly, there are ~3 million of these vehicles on the roads today. However, the Detroit News is reporting that a majority of these owners are opting for non-GM products when they’re in the market for a new vehicle – brands such as Honda, Nissan and Toyota. These figures compare to an industry-wide brand retention rate of ~48%. The statistics on Saturn are probably the least surprising. After all, Saturn was promoted as “a new kind of car company” – presumably in stark contrast to other GM car brands as much as any rivals. It stands to reason that Saturn owners would probably find almost any other company preferable than staying with GM. GM has certainly tried to keep its customers from straying – including offering special deals such as one-year free maintenance programs, discounts on new GM auto purchases, offers to test-drive GM cars, and special invitations and events to introduce customers to new GM dealers. What about Ford Motor’s experience in dropping the Mercury brand from its lineup? It turns out the news for them has been better. In fact, Ford has managed to hold on to ~46% of Mercury customers. Ironically, the company has benefited from what might normally be considered a brand weakness: the Ford and Mercury lines had very little differentiation between them. Thus, it has proven easier to shift Mercury owners to Ford vehicles as an alternative. Chrysler went through its auto brand downsizing a bit earlier … the Imperial nameplate disappeared back in the 1980s (I know: I owned one of the last models manufactured) … while the Plymouth brand bit the dust seven years prior to the 2009 economic near-meltdown. Instead, the big news at Chrysler has been its shift from one foreign parent company (Germany’s Daimler-Benz) to another (Italy’s Fiat). For many, the jury may still be out on the long-term viability of Chrysler – the next two or three years will be the acid test. ← How Are Social Media Behaviors Changing?